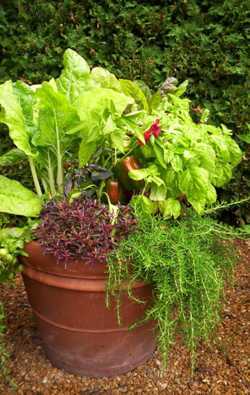 Vegetables are very adaptable to growing in containers if given a few basic requirements: full sun, a well-drained soil with copious amounts of organic matter, and consistent watering. If you are new to vegetable gardening, start out with just a few containers so you can have success in your first season. The next season you can always add more. Happy Gardening! Bush green beans do well in containers as small as 8" deep and 8" wide per plant. Try 'Bush Blue Lake' or 'Contender' for good flavor and consistent production. 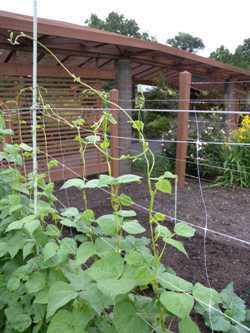 Pole beans need a larger container and a sturdy trellising system. 'Cherokee Trail of Tears' can be grown both for fresh green bean or as a dry bean. Beets work well in combination with other greens. Plant an early spring crop and again in mid-summer for a fall crop. Don't forget that beet leaves (greens) are also edible, like chard, as they are both the same plant species, just different varieties or selections. 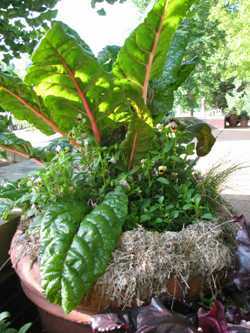 Chard is becoming a container super-star as the beauty (and taste) of the colorful foliage are realized by container gardeners everywhere. Plants can be harvested throughout the summer and into fall. If kept picked, tender chard leaves can be used in salads. If the leaves are older, they make a great summer spinach substitute. Asian greens like 'Tatsoi' or mustards like 'Red Giant' grow well in containers. 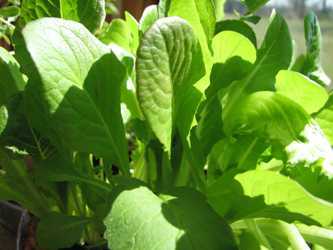 Other salad greens such as arugula, which can be started indoors under lights at the end of winter, are good choices as well. Outdoors, sow as soon as the soil is workable. Kale and collard greens can extend your harvest into summer and fall so that you will always have greens available to cook. 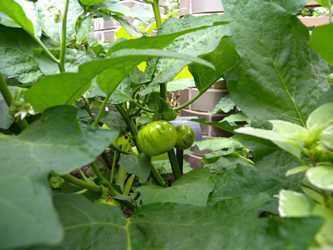 Eggplants are very ornamental when grown in a pot, especially the purple asian varieties. Try the hybrid varieties 'Hansel' or 'Gretel' for compact plants and good production. You will need to stake the plant, like with most vegetables, in containers. 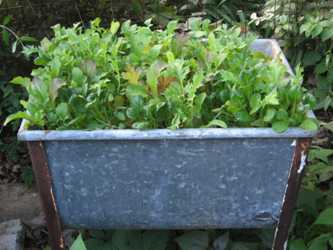 Lettuces grow very well in a spring or fall container. They can be sown directly into a container or planted as transplants. Some gardeners get creative and make salad balls by connecting two wire baskets and then planting with salad plugs. 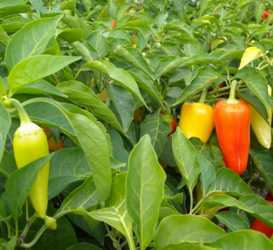 Peppers do well in containers and don't need as much water as other plants, such as tomatoes. The variety of colors, flavors, heat, and sizes is endless. 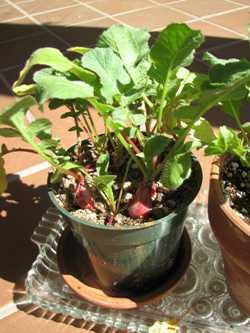 Radishes are fun plants to grow with young children as they grow quickly, satisfying eager beginners. Harvest before temperatures begin to rise as they develop strong flavors later in spring. 'French Breakfast' has a mild flavor and tasty crunch. 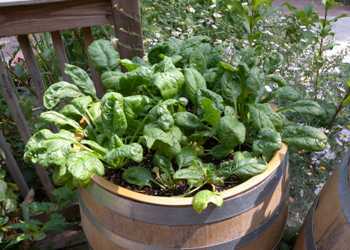 Spinach can be started in succession for a ready supply through spring and fall. The plants will bolt when the weather gets hot. 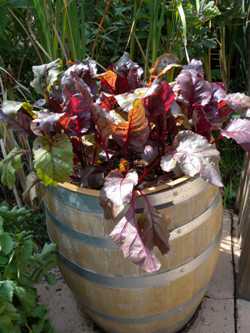 Consider growing chard or other heat loving plants in the height of summer. 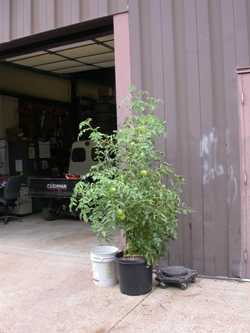 Tomatoes grown in containers are great for people who don't have many sunny locations. It may be the first vegetable people grow in a container. If you have had disease problems and don't have room to rotate your plants, consider putting a tomato plant in a pot with fresh potting mix. Try a determinate variety like 'Celebrity' or 'Rutgers' for a smaller growing plant. You will still need to stake or cage it but won't need to prune it as much. 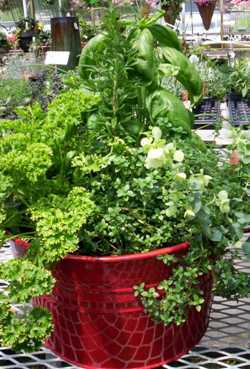 Although not vegetables, a variety of herbs do well in containers. Mint in a container is a necessity if you want to keep it out of your lawn and perennial and vegetable beds. Basil, sage and parsley all do well in containers. Be sure to separate water loving basil from a dry soil loving plant like sage.